PHILADELPHIA—Following the announcement Saturday that a deal had been reached to end the league-wide lockout, an exuberant Allen Iverson told reporters that every single NBA player, a group that "includes myself, obviously, because I am a current NBA player," is excited to return to the hardwood. "It's been a tough time to be an NBA basketball player, but we—and by 'we,' I mean the group of 450 players who play in the National Basketball Association, of which I, absolutely, no question, am still a member—are looking forward to putting this all behind us and getting back out there," said Iverson, who hasn't worn an NBA uniform in nearly two years. "I'm really proud of the way we stuck together during negotiations, and I think we have a great new deal in place that finally allows us to focus on doing what we do best: playing the game of basketball." "By the way, when I say 'we' and 'us,' I am using the collective nouns inclusively to refer to myself as part of a group," Iverson continued, "and in this case that group is composed of players in the National Basketball Association—of which I am decidedly a part. Understand?" Iverson, who hasn't played professional basketball since his one-month stint in 2010 with Besiktas Cola Turka of the Turkish Basketball League, said that fans can expect all NBA players to be ready for the opening tipoff, and that as an active member of a 15-man NBA roster himself, he will certainly be no exception. 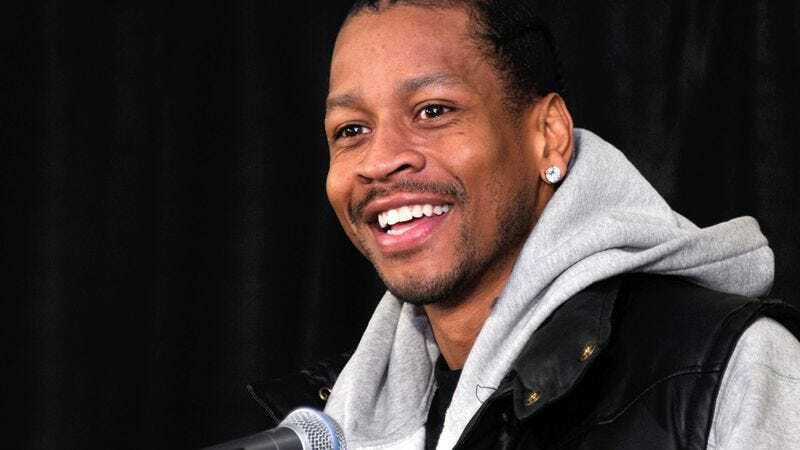 Moreover, Iverson reported that he is looking forward to reuniting with his teammates, which he said he "most definitely has, because obviously everyone on an NBA team has teammates, and therefore, I, the NBA's Allen Iverson, have teammates." While Iverson noted that a 66-game season is far from optimal, he said that—because he is just like every other player who spends the majority of his time participating in both home and away games as part of a rigid schedule that he must adhere to as a contracted member of the National Basketball Association—the only thing he's focusing on now is the NBA championship, a title Iverson stated he is eligible to win because of his current status as a full-time salaried professional player at basketball's highest level. Iverson added, more or less unprompted, that on forms where he has to list his occupation, he writes, "NBA basketball player," because, according to Iverson, "I am one." "I think we're all looking forward to getting out there and putting on a show for these fans," said Iverson, who at press time is not listed as an active player on a single NBA roster. "Guys like LeBron James, Dwyane Wade, Dirk Nowitzki, me, Kevin Durant, Dwight Howard, Chris Paul—we're showmen. All of us. See, I'm in the group I just mentioned, because they are current NBA All-Stars and so am I. If I weren't in the NBA, I wouldn't have put my name in there, but I am in the NBA. I am." Taking a moment to reflect upon the recent labor agreement, the former Philadelphia 76er told reporters that at times he was nervous the 2010-2011 season wouldn't be salvaged, an outcome Iverson explained would have affected him much more than, say, players who are no longer in the NBA, a group whose company Iverson stated he is not even close to being in. But Iverson said he was confident a deal would be reached, noting that, ultimately, "NBA players just want to play basketball in the NBA." "I really love playing basketball," Iverson said. "To be perfectly honest, it's the only thing I can do. Making it to the NBA was my lifelong dream. So you can imagine how we must have felt when we thought the ability to continue that dream was being taken away from us." "You believe I'm in the NBA, right?" added Iverson, growing visibly emotional. "Because I am. I mean, it's not like I've lost a step. I'm just as quick as I was when I was 22 years old, right? And it's not as if you've watched one the greatest shooting guards of all time physically and mentally deteriorate before your eyes over the past five years, so why wouldn't I be in the NBA? Seriously, can any one of you answer that question? Because I certainly can't. And because I am in the NBA, I guess it's not even a question worth asking. Right?" Iverson was then cradled by his wife, Tawanna, as he began murmuring, "I'm an NBA basketball player," over and over until he abruptly stopped, sat up in his chair, and stared vacantly at the reporters before him.